The Sunday Salon 1.23.2011 – my books. my life. I’ve had a busy little weekend of productivity. I am participating in Bloggiesta and it forced me to finally finish fixing the formatting on all of my old posts AND create a alphabetical-by-title books read/review directory. So now you can read my posts all thy way back to February 2007 without any wierdness getting in the way (but I don’t necessarily recommend it – I wanted to delete about half of the posts). And, which I definitely recommend, you can browse my books by title now HERE. Someday, I will have the alphabetical-by-author directory up but that’s going to have to be done by hand. Next Bloggiesta perhaps? I also grew frustrated by the variations of white walls, white trim, light carpet that apartment living has forced on me and picked up a last minute painting project. 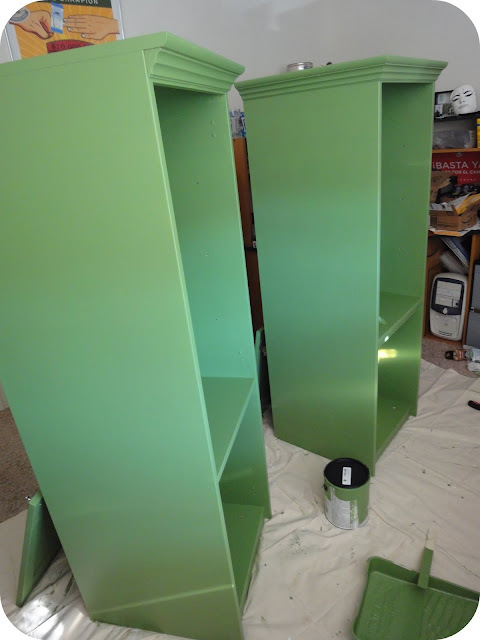 I decided to paint the entertainment-center-turned-china cabinet that we have in our dining area. We got it for free and it was a very light pinkish color which neither of us really liked. Well now it’s GREEN! We’re a bit obsessed with green – there is a little bit of it in every room. 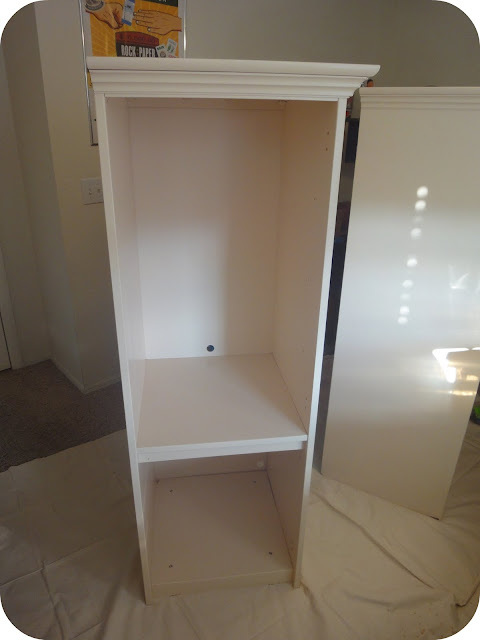 It just needs one final coat today and I will have a new china cabinet. Now I have the painting bug (I enjoy painting more than normal people) and I am trying to think up more projects (this will almost certainly include the middle section of this piece that we keep in the guest room). I am going to keep painting and Bloggiesta-ing today and maybe even get a little reading in. Have you accomplished anything this weekend? Oh, I love green. They look great! Oh, I love green, too…(and red! ), but not necessarily together…LOL. In my former residence,which I owned,I was able to paint the walls…can’t do it here. But I had a lovely sage green bedroom. What a lot you accomplished for Bloggiesta. The task sounds overwhelming to me! That’s a pretty color! Much brighter and nicer than the old one. As for me, today I’m watching football and doing some mindless but time-consuming Bloggiesta schtuff. Your shelves look gorgeous! I love the colour. Green is my favorite color. That shade is so vibrant. I love it. SO pretty! I love how calming that green is. It is just soothing to the eye. I can’t wait to see it in person! The green is really lovely! I don’t have the patience to paint but I admire everyone else’s patience! Pingback: Even More House Pictures | my books. my life.